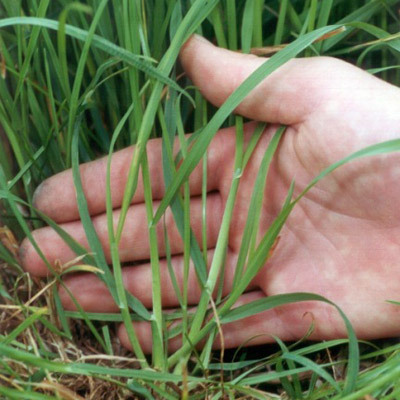 Cocksfoot is the most persistent pasture grass, and is tolerant of dry conditions and most insects, but typically lower in feed value than ryegrass. It is most commonly used as a minor component of dairy pasture mixes in summer dry areas, sown at 2-3 kg/ha, to help summer growth. Newer fine leaved cultivars have been bred which are easier to manage in a pasture. The total DM yields from cocksfoot can be similar to perennial ryegrass. It has significantly less cool season growth than perennial ryegrass, but its summer growth is good, and can be better than ryegrass in dry conditions. Cocksfoot is generally very tolerant of pests, including grass grub.